One of the bright attractions of Minsk is the Church of Saint Simon and Helena, so-called the Red Church, located on Independence Square. 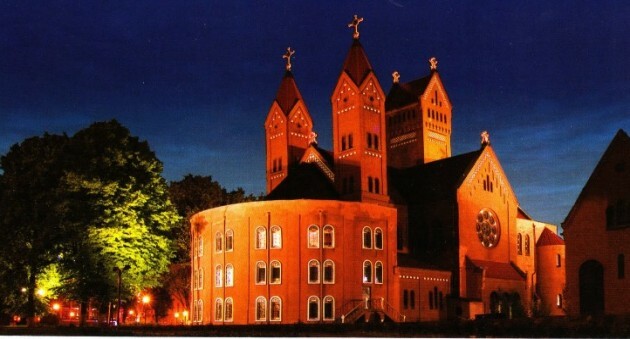 At the end of the XIX century the Catholics of Minsk decided to build another church. At that time there’s only one Catholic Church situated on the Cathedral Square of Minsk and two small were outskirts. In 1905 the authorization for constructing a Catholic church in Minsk was granted. Edward Voinilovich, a large-scale landlord, was the main sponsor of the construction. He and his wife decided to dedicate the church to Saint Simon and Helena in memory of their deceased children. Tomas Poyazdersky, a great architect, designed the project together with Mr V. Marconi and G. Guy. In September 1906 Mikhalkevich, a priest, consecrated the first stone of the future church. The building was completed two years later, starting the interior. To this matter were invited a great sculptor H. Ott and outstanding painter F. Bruzdovich. The architecture of the church was unusual for the time - Neo-Gothic with modernist style elements. The high rectangular tower - a symbol of eternal grief of parents who had lost children, became the basis of the composition. The other two towers were named by Simon and Helena. The coat of arms of Voinilovich was placed on the triangular board on the front of the church. Currently there is the emblem of Minsk. The solemn consecration of the new church was in November 21, 1910. In 1923, the church was sacked like other churches of the city and later closed. The building was occupied by the Polish State Theater, then by the Film Studio "Soviet Belarus." In 1975 the Republican Club of filmmakers (the House of Cinema) was in the building of the temple. In 1990, the church was returned to the Roman Catholic confession. In 1996, a bronze sculpture of the Archangel Michael, considerable saint patron of Belarus was installed before the temple and lighted. The composition symbolizes the triumph of the heavenly host over the forces of the darkness. In 2000 the Turin Cathedral donated a copy of the Shroud of Turin to the Catholic church. In 2000, a memorial sign "The Bell of Nagasaki" - a monument to the victims of Hiroshima, Nagasaki and Chernobyl was set next to the church.